You no longer need to hide your smile because of gaps, chips, stains, or misshapen teeth. With veneers, Dr. Login can easily correct your teeth's imperfections to help you have a more confident, beautiful smile. Veneers are natural in appearance and are a perfect option for patients wanting to make minor adjustments to the look and feel of their smile. Veneers are thin, custom-made shells made from tooth-colored materials (such as porcelain) designed to cover the front side of your teeth. 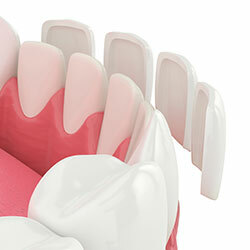 To prepare for veneers, Dr. Login will create a unique model of your teeth. This model is sent to a dental technician who creates your veneers. Before placing your new veneer, Dr. Login may need to conservatively prepare your tooth to achieve the desired aesthetic result.